Hitman Glass tubes shining in the Colorado sunshine. 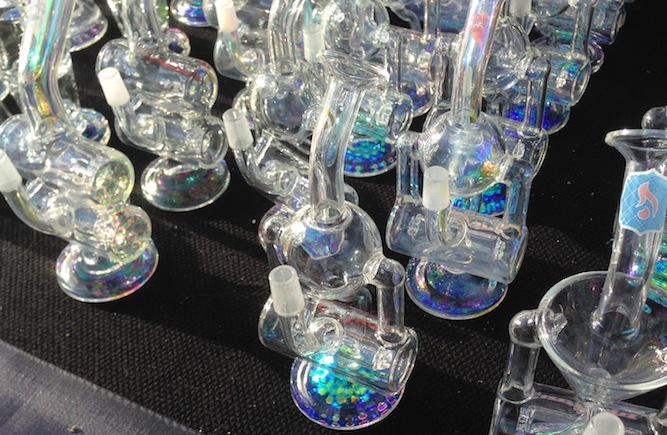 The 2014 High Times Cannabis Cup ran this past weekend in Denver, with tens of thousands of people showing up to get high, get happy and celebrate our favorite plant and the recent legalization of cannabis use and sales in Colorado over the last few years. As always, the event is also the time for cannabis product makers to show off their goods. Below are our top ten eleven pipes, bongs, vaporizers and other devices on sale over the weekend. These kept catching my eye. The cool hockey puck design creates a heavy, solid base when filled with water, and the tiny divot in the top glass acts as a water deflector for the straw-like stem. The one with the white mouthpiece in the foreground even glows in the dark. The Nexus guy behind the table must have seen my eying them all day, because the third or fourth time around, he called me over and told me to take my pick for $200. It took a lot of self-control to not pull out my wallet. The company is out of L.A., so reach out at [email protected] if you’re interested. Like seemingly everyone else on the planet, I’m hooked on the crack that is Game of Thrones. No wonder these two pipes looked like something straight out of the desert tent of queen Daenerys Targaryen — because you know she would be smoking some really, really good hash. I didn’t get a price or the name of the glass shop, so if anyone has that information and could share it, it would be awesome to give some credit where credit is due. Continue to keep counting down William Breathes’s top eleven products of the 2014 High Times Cannabis Cup. There’s so much going on in this sick little handheld piece from Colorado-based Maryjane Glass that I had to stare at it for an uncomfortably long time just to figure out. That also could have been due to the spliff of Skywalker OG I had in my mouth at the time. I didn’t get a price, but you can reach the company at Facebook.com/maryjaneglassworks if you’re interested — and I know you’re interested. Pretty much self-explanatory. It’s a bass guitar that is way too fragile to play, doesn’t have any tone and has a bunch of spiders blown into it. But you can smoke weed out of it, dude.